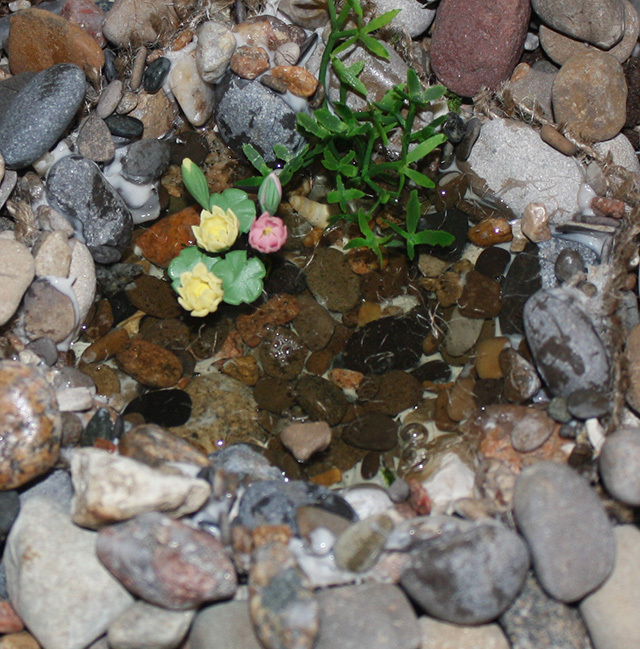 This little pond is 4″ in diameter across the water section. It took about 4 hours to make including drying time for silicone and acrylic ‘water’. I used my favorite, always at hand, beach pebbles. I always have a bucket of pebbles handy so I used it to make my form. Any other material like sand or cornmeal that will form a depression to work in will do. Dig a depression into your material of whatever size you choose. Arrange the plastic inside the depression with an inch or two extending beyond the finished area you want.Then lay the burlap over the plastic and press into the depression. Using a caulking gun cover the burlap area with enough caulking to allow the caulking to squeeze up around the stones when you put them in. Arrange stones. After I placed the big ones I sprinkled some smaller ones over it to cover up any caulking that showed between the stones. This could be done after it dries and before adding water as well. You could also use chipped glass – clear for sparkle or perhaps blue. Let the whole mess dry and cure for 2 hours or according to the directions on the caulking you have. Add Scenic Water according to directions. When the ‘water’ is about half hardened… in this case with the ‘water’ at less than half an inch deep- in approximately half an hour you can poke decorative flowers in and they will stand up. Wait about another hour and you can remove the pond by slipping your hand under the plastic. Cover the water area with another piece of plastic to keep it clean while you snip away the extra burlap from the pond edge. Now you can dig a little whole in your miniature garden for the pond to sit in. Remove the plastic from the bottom of the pond and tuck your pond into it’s new home. I surrounded my edges with loose pebbles and larger stones.Have fun with it! This entry was posted in DIY Projects and tagged DIY fairy garden, DIY fairy garden projects, fairy garden, fairy gardens, miniature garden, miniature gardening, miniature gardens by Marthe Hook. Bookmark the permalink.